NASA have put out a press release about Hubble Space Telescope observations of WASP-33b. WASP-33b is the hottest of the WASP planets, being the only one so far found orbiting a very hot A-type star. A team led by Korey Haynes from NASA’s Goddard Space Flight Center, have used Hubble to show that WASP-33b has a “stratosphere”. The spectrum in the infra-red is best explained by a temperature inversion caused by the presence of Titanium Oxide in the atmosphere. 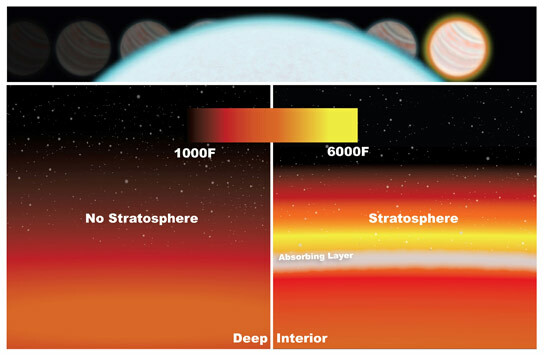 By comparing models with and without a temperature inversion to the spectrum of WASP-33b, as observed with Hubble’s WFC3 instrument, Haynes et al “make a very convincing case that we have detected a stratosphere on an exoplanet”. The work has been reported widely, in over 100 news and science websites, such as by SciTechDaily, Pioneer News, The Daily Mail, and NY City Today. This entry was posted in exoplanet atmospheres, Hot Jupiters, Hubble Space Telescope, WASP planets and tagged NASA, stratosphere, WASP-33b on June 14, 2015 by waspplanets.